According to the American Dental Association (ADA), your oral health is sometimes the first to feel the impact of a bad diet. When you eat sweets and carbohydrates, the bacteria in your mouth converts the sugar in those foods into acid. Acid erodes enamel, causing tooth sensitivity, decay and, eventually, cavities. Knowing what to eat for optimal oral health is important but when you eat is key too. Candies and cough drops stay in your mouth for much longer than easily chewed foods and will result in more damage. Similarly, munching all day on carb-loaded and sugar-heavy snacks exposes your teeth to more acid throughout the day. We recommend you eat these foods during your regular meals and rinse your mouth after snacking. Substitute sugar-laden drinks such as soda and lemonade with unsweetened tea, coffee, milk, orange juice (fortified with vitamin D and calcium) and, of course, water. A wholesome diet consists of a variety of fruits and vegetables, lean protein, legumes and whole grains. Calcium-rich foods are at the top of the list for better oral health. Think beyond milk—cheese, plain yogurt, nuts and even leafy greens all contain calcium. Dairy products and nuts will also provide protein, which will help you to stave off hunger. Finally, here’s a tip to help you freshen your breath and clean your teeth with no toothbrush around. Have an apple! Though they’re not a substitute for regular brushing and flossing, crunchy foods help to remove plaque and stimulate saliva production, which, in turn, will help to wash away acid. Carrots and celery work well for this too and are also low in calories. Trick or treat! Yes, the day is here: Halloween, the enemy of dentists everywhere. Or is it? As your dentist, Dr. Roberts has some opinions about Halloween. We want you to teach your kids about moderation, healthy choices, “everyday” foods and “sometimes” foods. We would never advocate an entirely sugar-free existence for most children. Restricting access to candy only serves to make it that much more attractive. What we do recommend is teaching children about making good choices. Use a smaller trick or treat bag. Put away the pillowcases and go with a small bag or pail. There’s no need to gather enough candy to last until next Halloween! You can make this fun for younger children by buying a small bucket that matches their costume, or helping them decorate their own trick or treat bags. Fill up before you go out. Feed your kids a hearty, healthy dinner so their bellies are full and satisfied, and take bottled water with you to trick or treat. Don’t allow snacking between houses. Tell your children that all candy must be inspected at home (you should do this anyway!) and is not to be eaten “on the go.” This will keep them from overindulging. Let your children participate in making a candy plan; use this as a teaching moment! Talk about healthy eating habits and eating sweet things in moderation. Come to an agreement about how many pieces of candy they can have each day, or how much they will keep and how much they will donate to a homeless shelter or care package for troops overseas. Offering them ways to be of service and giving them choices can ease the sting of “giving up” some of their candy. Keep the candy out of reach so they can’t sneak secret snacks when you’re not looking, and be sure they always brush their teeth after a candy treat! Halloween is one day out of the year, and a little indulgence isn’t going to derail an entire year’s work. Make healthy choices part of your lifestyle, and allow your children (and yourself) occasional treats. Focus on responsible choices and moderation, and your kids will grow up with some valuable life skills! If you have diabetes, you know that high blood pressure can have devastating effects on your entire body. Your teeth and gums are no exception, but with diligent care and hygiene, you have the power to control your oral health the same way you control other aspects of your diabetes. Prevention is the best cure for gum disease associated with diabetes. Be sure to inform the dental professionals in our office if you have diabetes, so we can tailor your care to your particular needs. Scheduling regular cleanings, taking care to brush twice a day and floss daily, committing to managing your blood sugar levels, and not smoking are all keys to preventing serious periodontal problems. The trained professionals at Dr. Roberts Family Dentistry are happy to answer any questions you may have about your diabetes and how it might affect your teeth and gums. During pregnancy, hormones (in particular the increased estrogen and progesterone) can cause unexpected changes to your teeth and gums. These increased hormones can make your gums particularly vulnerable to plaque, easily leading to periodontal disease such as gingivitis. It’s especially important to maintain good oral hygiene throughout your pregnancy. The professionals at Dr. Roberts Family Dentistry are trained to recognize and treat early signs of periodontal disease in pregnant women, so it’s in your best interest to visit the dentist early in your pregnancy and inform the office that you’re expecting. Regular exams and cleanings pose no health risk to your unborn baby, but the bacteria found in gingivitis have been linked to pre-term delivery and low birth weight. Let your dental professionals work with you to focus on your dental health needs as part of your overall prenatal health plan. The most important habit you can cultivate to keep your teeth and gums healthy is to brush and floss every day. 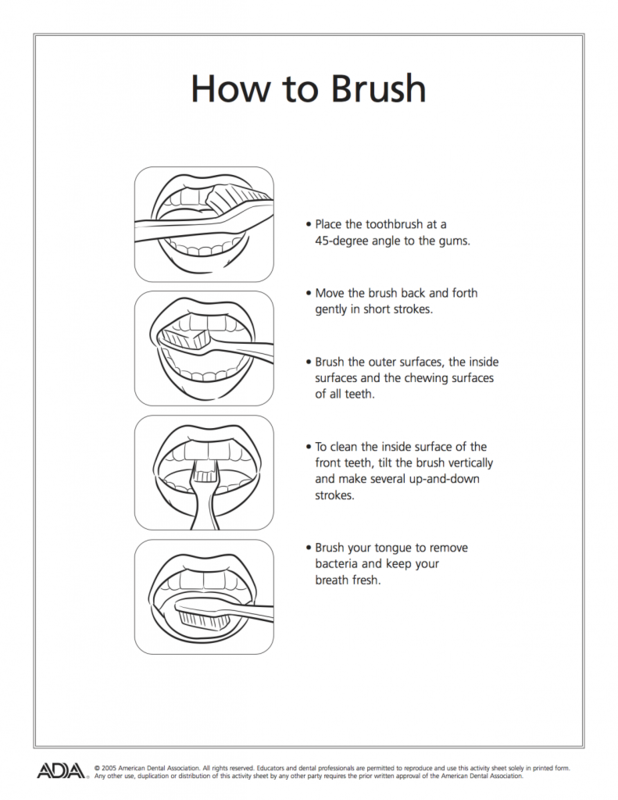 Brush for at least 2 minutes, at least twice a day, and floss between each and every tooth once daily. Always look for toothbrushes, pastes, and flosses with the American Dental Association Seal of Acceptance; these products have been evaluated by an independent body of scientific experts on behalf of the ADA, so you can be sure they’re safe and effective. Choose a soft-bristled brush; hard bristles can aggravate and damage your gums and tooth enamel. Also be sure you’ve chosen a brush that’s the proper size and shape for your mouth. A brush that is too big or too small won’t reach everywhere in your mouth that plaque hides. Finally, be sure to finish up your brushing routine with floss, which cleans in between your teeth where no brush can reach. An equally important habit, of course, is regular professional dental care. We encourage our patients to visit once every 6 months for a check-up and cleaning.